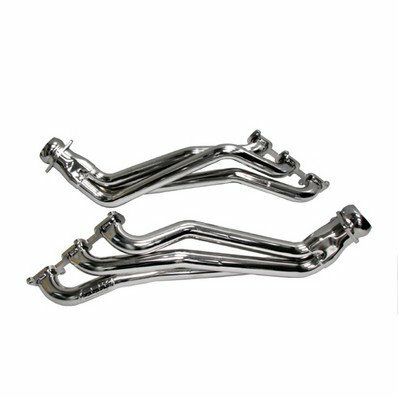 ALL New 2011 Mustang V6 Full Length Headers & High Flow Short Mid X Pipe From BBK Now Available. Take a first look at the all new 2011 Ford Mustang V6 BBK 1-3/4 Full Length Headers and high flow 2-3/4 X pipe. (available separately) BBK R&D department developed these headers with one thing in mind Getting even more horsepower and torque out of the all new 2011 V6 Mustang that is already putting out nearly twice the horsepower of its V6 predecessor!This all new rugged BBK header design is constructed with 1-3/4 CNC Mandrel-Bent tubing and solid 3/8 laser cut exhaust flanges.Initial testing is showing gains of around 25-30 plus horsepower with the high flow catted X pipe and BBK will have an off road version available for even more horsepower gains - Look for the full installation and test article in the upcoming 5.0 and Super Fords Magazine written by Tom Wilson.The headers are available as usual in 3 different finishes. Part#-1461 - Short Mid X Pipe w/Converters. Part#-1462 - Short Mid X Pipe Off Road.